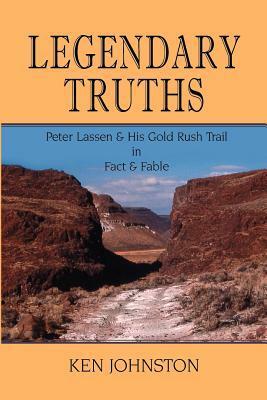 Again and again, there are references to those “legendary truths.” Mr. Johnston, having clearly and admirably done his homework, refutes and clarifies and investigates and corrects every historical “fact” about Peter Lassen without first establishing who or what he’s responding to. It’s like reading a transcript of a debate, but only the rebuttals. I too, like Sara, wanted to learn more about Peter Lassen following a visit to Lassen Volcanic National Park. The first section of the book about Lassen’s life prior to the widespread use of the trail he pioneered, and the final section about his death, are both very interesting. Peter started to remind me of Forrest Gump, in how he managed to meet most of the famous players (or bear witness to, or became associated with major events) in the founding of California as a state. However, there are no known firsthand accounts of Peter’s life. Was it that Peter (born in Denmark) never learned to write? I vaguely recall Ken Johnston wrote that was the case, which is why there are no letters or diaries; I defer to Mr. Johnston, so I don’t start more rumors about poor, much-maligned Peter.